Host Steve Montoya chats with Bay Area coach who helped develop soon-to-be Super Bowl quarterback. In advance of Sunday's Super Bowl, the High School Football Coaches Podcast features Marin Catholic (Kentfield, Calif.) head coach Mazi Moayed, who mentored current Los Angeles Rams quarterback Jared Goff during his prep days. Goff won't be the only one with something on the line Sunday as Moayed is sparking a bit of a friendly rivalry with the head coach at Tom Brady's old school, nearby Serra (San Mateo). "I’m good friends with the current head coach there, Patrick Walsh," Moayed said. "We made a side deal, depending on which side wins, the other coach, principal and president have to wear the opposite team’s swag. And put it on Twitter. That makes things fun." See and hear the complete episode --- including Moayed on adjusting your gameplan to a star player, multi-sport athletes and the Bay Area's quarterback tradition --- in the video below. 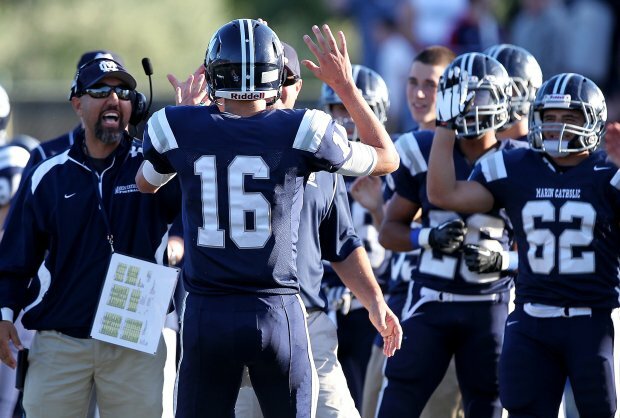 Moayed has led Marin Catholic to seven league and three section titles. With Goff under center in 2012, the Wildcats went 14-2 and reached the Division III state championship game. Prior to arriving at Marin Catholic, Moayed coached at three other Bay Area high school as well as College of Marin. With the goal of being a go-to resource for coaches, check back each week as host Steve Montoya interviews those making a difference in the game. Marin Catholic head coach Mazi Moayed (left) shares a moment on the sideline with Jared Goff (16).